Last year I purchased far more nail polish than I'd care to admit to. This year it seems I'm obsessed with lip colours. Being pale is a blessing in this instance as I can wear pretty much any shade of red I buy and can wear bright colours too. Hooray for me! 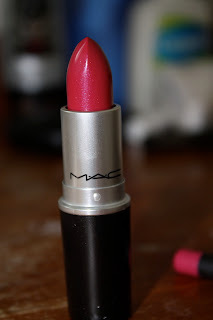 MAC Cremesheen lipstick in Lickable, around $40. MAC lipsticks create; "colour plus texture for the lips. Stand out on the runway and simmer on the street." These are the products that made MAC famous. This lipstick is a touch on the pricy side but I love it. It goes on smoothly, the colour looks vibrant without being too overpowering and it is long lasting. It even stayed in place the entire time whilst I drunk a bottle of iced tea. How's that for impressive? MAC lip pencil in Embrace Me, $36. This pencil is designed for shaping, lining or filling in the lip. They have a smooth, creamy texture and are long lasting. The colours of MAC's lip pencils are protected by Vitamin E, which acts as an anti-oxidant. I have a really thin top lip so unless I put a liner on, the contour of my lip tends to disappear. This pencil works perfectly with the above lipstick. i'm sure it'd work with my bright red too, although I am yet to try it out. 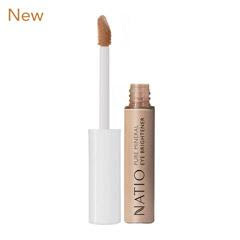 Natio Mineral Eye Brightener, $23.50. This products gives eyes an instant lift and is perfect on its own or under eye makeup. It contains jojoba to moisturise and assist in fighting fine lines. As someone who doesn't get enough sleep, this brightener is great to light up the eye area, and when worn with eyeshadows, those products seem to last longer. You only need to apply this sparingly. A thin layer over the eye area will do just the trick. 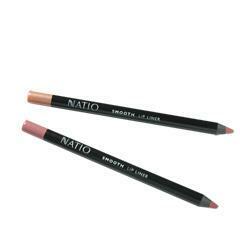 Natio Smooth Lip Liner in Scarlett, $17. This product has been discontinued unfortunately, but it still seems to be available in stores here so if it's something you want you may be able to still get one. This liner has a waterproof and smudge proof formula, meaning feathering doesn't occur. The liner is long lasting and is easy to apply. It can be removed easily too should you make any mistakes. -MAC Cosmetics are available at Department Store Counters nationwide & in MAC Stores throughout Auckland. -Natio Cosmetics can be found at Farmers nationwide and some pharmacies. At the moment Farmers have 10% off all their Natio products if you're a Beauty Card holder too if you're tempted to have a look at the range. All MAC product photography by me. Natio Cosmetics images from here.